Robot II Luftwaffe Eigentum Black, an outstanding Army Robot Camera. During the world war II, Otto Berning produced his famous Robot Luftwaffe Eigentum ( Air force property), this was a special production of flight recognized cameras. This is a beautiful F serial, 4th version of 1942, with Long-long advance knob (48 exposures) and two holes on top. 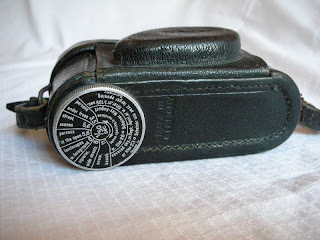 The F serial comes from the german word " Flieger" or " Flyer", with the famous Sonnar 7,5 cm lens ,in aluminium body of 1941, a rare war time lens, the most popular lens was the Tele-Xenar of 7,5 cm, the Biotar 2,0, and the Xenon 1,9 lens. 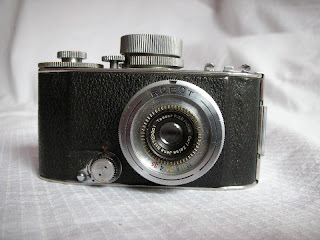 Only a few units of this versión was fited with the Carl Zeiss 7,5 cm Sonnar. The camera was used in several German fighter planes like the Messerschmitt BF 109 and 110 and the Focke Wulf 190. In the last one the camera was mounted in a cradle in the right wing and was connected with the guns. The camera could also be used handheld by the crew. This is a very little master piece of collection. Some research say that 20.000 units were made,many of them were lost in air crashes or ruined over time. It is very difficult to get one of those currently running, and in the future the price will be much higher than now. A very unusual Carl Zeiss Sonnar 1:4 7,5 cm Luftwaffen Eigentum lens. 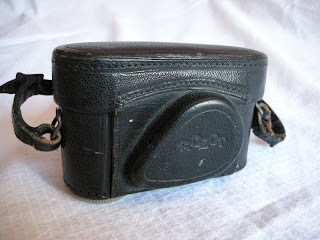 Very hard to find is this War Time lens, made for the Robot II Luftwaffen Eigentum Camera. Most common are the Tele-Xenar and the Biotar lens. The Robot II introduced in 1938, has all the improvements of Heinz Kilfitt.A 40mm f2.0 Biotar was fitted as the standard lens. The film could now be fed from a standard 35 mm cassette but still required a Robot cassette for take up and the camera was syncronized for flash. Robot II early and late model with Biotar lens, see the detail of the knob. 80.ooo units of Robot II build were. 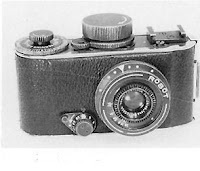 Robot II pre-series with the blue 90º viewfinder, a rare transitional camera between Robot I and the Robot II standard series.